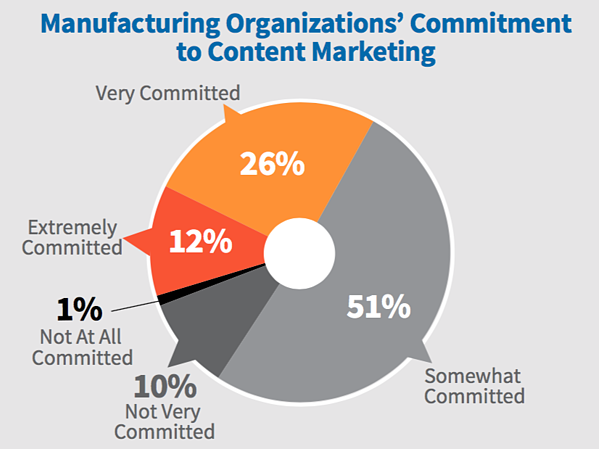 Every year the Content Marketing Institute releases its annual benchmark report on the manufacturing industry. Here are five trends to play close attention to in 2018. 1. 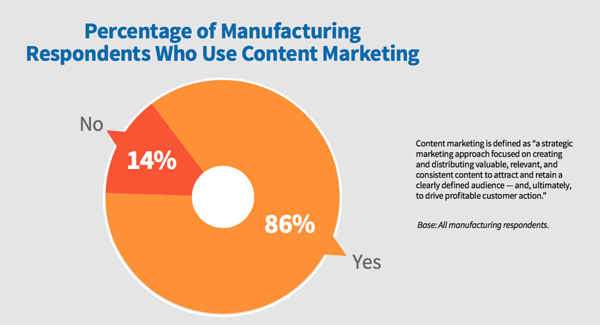 The majority of manufacturing companies are using content marketing as part of their overall strategy to attract visitors and to gain and retain a defined audience. Observation: Although most companies use content marketing, very few are in the mature or sophisticated maturity level stage. 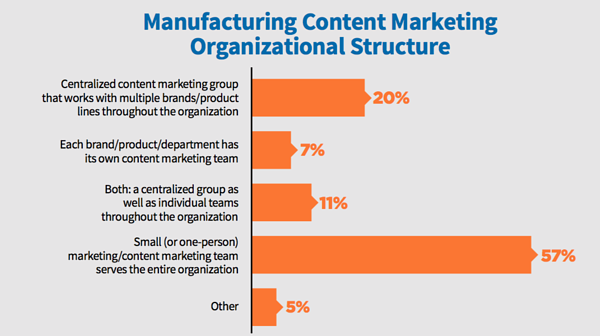 This represents a tremendous opportunity for other manufacturing companies to develop a solid content marketing strategy before the rest of the competition catches up with the leaders. Action Item: Content marketing is a critical piece of a solid inbound marketing strategy to attract visitors, generate leads and close sales. If you are new to content marketing, you should learn about inbound marketing and how content marketing fits in. RELATED CONTENT: What is Inbound Marketing? 2. 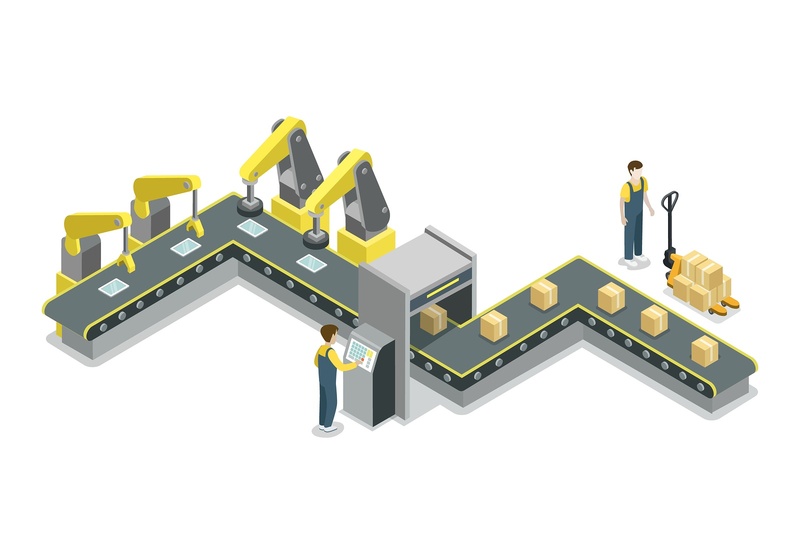 The majority of the manufacturing companies have a small team, or a one-person team, that serve the entire organization. Observation: Effective marketing requires a multidisciplinary team with specialized talent and skills that are rarely found in a single person. Those companies who have a very small or one-person marketing team are probably underinvesting in marketing. Action Item: Although spending varies across different industry and company sizes, knowing how much you spend on marketing relative to your peers is a good starting point to understand whether or not you are underinvesting. RELATED CONTENT: How much should you be spending on marketing? Observation: Support and funding for any project or initiative comes from the top. If there is a lack of commitment to marketing, it is very likely that senior management probably views marketing as an expense and not as a profit center that brings in new customers and generates revenue. Action Item: Executives are not interested in marketing statistics like reach or engagement. They are looking for a return on their investment. According to the Content Marketing Institute, only 33% of the marketing organizations measure ROI, and one of the biggest reasons is that they do not know how to calculate ROI. It’s critical for marketing to understand which metrics drive executives in their decision-making process. 4. Videos, social media and photos are the most effective forms of content for manufacturing companies. Observation: With the millennials now comprising the largest segment of the work force and moving into positions of influence and decision-making, it’s no surprise that these three mediums are effective. Action Item: Producing engaging videos, taking high-impact pictures and crafting the correct stories for social media are time- and resource-intensive activities. Before creating this type of content, make sure that you understand what drives this important and powerful generation in today’s workforce. 5. Digital distribution of content is the best method to tell your story. Observation: Email and social media are in the top three methods to distribute content. Integrating all these platforms, delivering a consistent, well-thought-out message and getting the content distributed can be overwhelming and labor-intensive. Wordpress or just about any content management system for blogging and content creation. However, using separate tools requires learning different interfaces, and reporting will be distributed across different platforms. Consider using a marketing automation tool to bring all of these solutions and reports under one roof.